All that snowflake making has only made me more excited to make pretty things for Christmas. Part of it is that we left our xmas decorations packed up in Canada, so we don't have much here and I love Christmas time. It's also making me quite sentimental to think that things I make this year will become "forever" things for Bun that will always have been part of his/her Christmas. For most of the year, I like a more restrained palette, but some of the fun of xmas is the garish, exuberant colours. 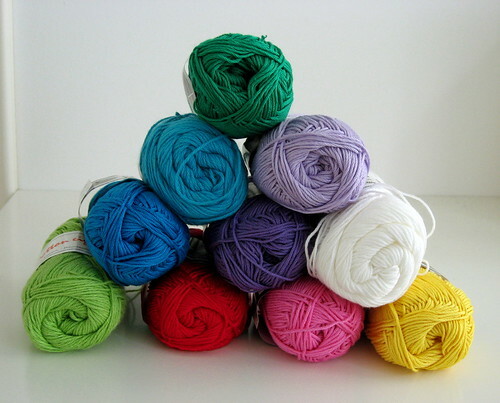 My sweetie is fond of bright, fun colours, so I bought a selection of ten colours of cotton yarn (pink, red, yellow, light green, green, light blue, blue, light purple, purple, and white) when we picked up my new sewing machine (yay!). I've started crocheting stars to make a garland, having been inspired by the cheerful, colourful style of one of my favourite blogs, Attic 24. My garland will have some stars like the ones in her advent garland and some small ones. 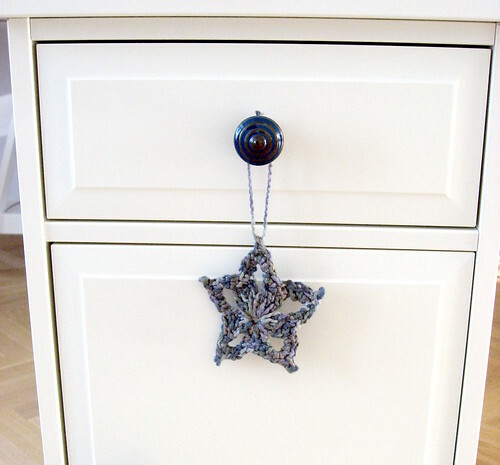 For all the details, see my Star Garland project on ravelry. 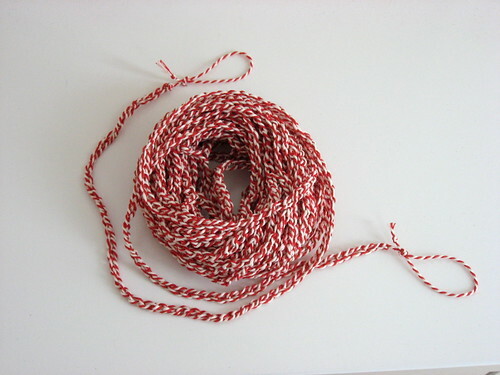 I have also started a candy cane striped garland using some cotton twine that I saw in the kitchen supply store. I just crocheted a simple chain, and tied some loops in the ends. I have plans to add some beads to make it a bit sparkly. This one is destined to be a tree garland, whereas I think the stars will probably hang on our bookshelf. 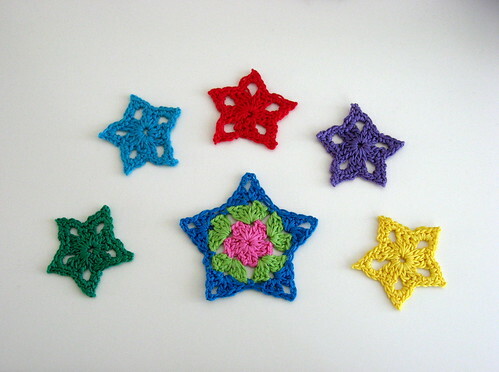 I also made a little one-off star ornament when I was learning how to crochet the small stars. I always have to guess about hook size since all my crochet hooks are vintage ones made of bone. They're lovely to work with, but I have absolutely no idea on sizing. I now have such a stash of yarn and on-the-go projects that I plan to buy myself one of the cute (and cheap!) straw baskets that I've been admiring in the market for months. I've been pretty good here about not buying things without having a clear idea of a specific purpose for them. That's been one of the excellent and enduring lessons of our overseas-move-decluttering, so it's always nice when something I admired aesthetically suddenly has a functional purpose for me! I'm having to rethink our holiday decorations too, since most of what I have are ones I collected as a child, and rather fragile. Lev is 2, and not so good about being gentle or leaving things alone when I'm out of the room. I picked up some garland with tiny origami stars from a gift shop, and added some large jingle bells from the dollar store. But our tree definitely needs more colour. I have a couple handfuls of acorn caps from Autumn walks, and was thinking of making felt acorns to go in them. But I might cheat and use pom-poms instead, to save myself some time.